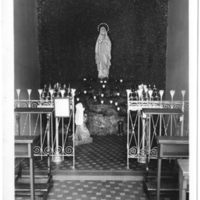 The statue of Mary inside the Lourdes Grotto at Mt Notre Dame. 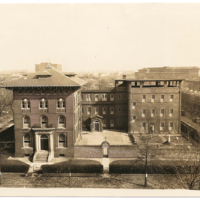 It was donated by Mrs. Adelaide Foss, a family member of a few Sisters. A front view of the Lourdes Grotto on the grounds of Mt Notre Dame. 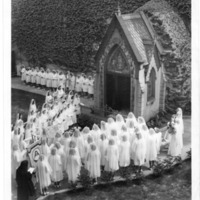 The grotto was built around 1910 and was moved to its current location in 1959 when the Juniorate building was constructed. 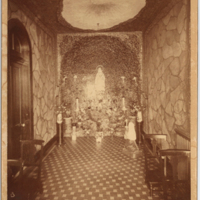 A view of the space in the grotto, which was connected to the convent at K Street. 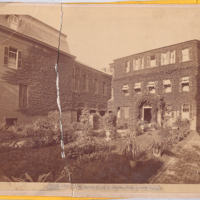 The grotto of Our Lady of Lourdes in the courtyard of the Convent at K Street. 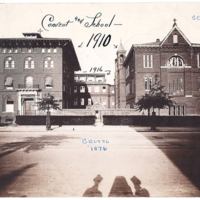 Before the attached school was torn down in 1923, the central building housed the Sisters on the first two floors, and the top floor contained music rooms. 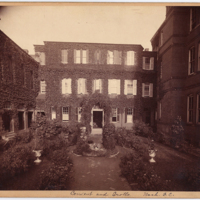 The courtyard at K Street. 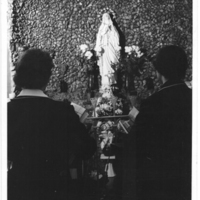 Two students praying to the statue of Our Lady in the grotto at K Street. 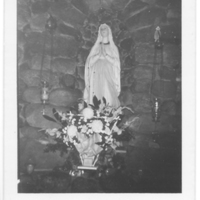 Early annals mention miraculous cures connected to the prayers asked in the grotto. A view into the grotto in the courtyard at K Street. 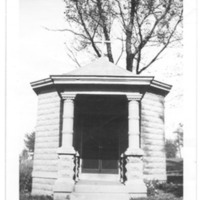 The grotto was built in 1876, along with the original Academy of Notre Dame on the K Street site. 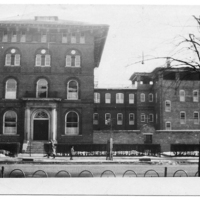 A view of the K Street Convent after the school was torn down in 1923. 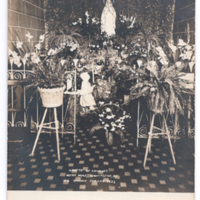 The gate to the courtyard was always opened so that passersby could stop in and say a prayer at the grotto of Our Lady of Lourdes.